Yes we know no one likes to talk about money but these are the financial rules of our business which you agree to bide by when you sign up for any of our services. You need to be aware of these so that you know how we bill for our services. 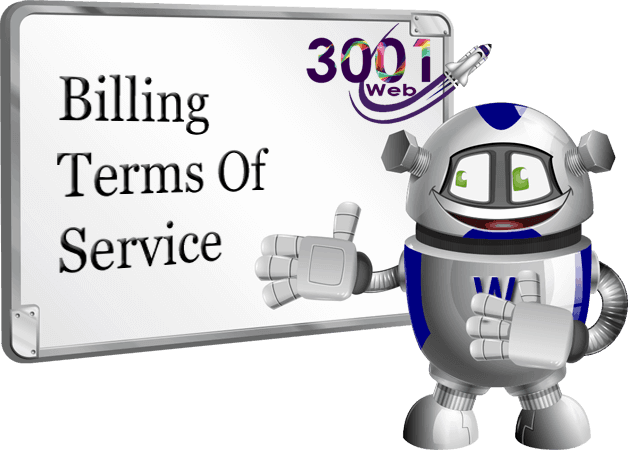 Below you will find our terms of service specifically related to billing practices at 3001 web. All charges payable by you for hosting services will be at the price of the package you chose when signing up for your account. All hosting fees MUST be paid in advance of the service being provided. Pricing for hosting will remain at the current price for the package you chose at the time of opening your account. Prices will only increase should you decide to upgrade your package or we ask you to move to a larger account as your site grows and needs more resources. At that time you will start to pay the current fee for the upgraded account. Should you hold more than one hosting account with us each account is treated as a separate account. Should hosting rates increase for any particular package the new price will be applied only to any new hosting accounts opened, existing hosting accounts will not be affected by the price increase. WITHOUT EXCEPTION ALL hosting fees should be paid on or before their due date regardless of payment method. It is the clients' responsibility to ensure payments reach 3001 Web on time. Invoices for hosting are sent 4 days prior to their due date. If hosting fees or any other invoice are not paid seven days after the due date your hosting services will be suspended. In total, this gives you an 11-day window to pay your hosting fees. Should your account be suspended for non-payment of invoices it will NOT be re-enabled until all outstanding invoices are paid in full. Should we provide you with an agreement to pay larger invoices in installments the total balance of that invoice must be paid by the due date. We use PayPal to process payments and also have a direct debit via Go Cardless or Bacs option available for UK clients. In the event a web hosting invoice is not paid within 30 days of the due date, 3001 Web will immediately terminate the unpaid hosting account from our servers. This will include deletion of all files, databases, email and other data. Once data is deleted it can not be recovered. 3001 web may employ freelance designers and programmers on behalf of our clients from time to time, therefore payments for site design, custom programming or program installation must be paid in advance of any work commencing.Where possible 3001 Web will make escrow type payments to the third party to protect the clients' funds until the work has been completed to their satisfaction, at which time the designer or programmer will be paid. By completing and submitting the electronic order form you are making an offer to purchase digital goods which, if accepted by us, is classed as a legal binding contract. Site editing work performed by 3001 Web staff will be billed by the minute according to the currently published fees for site editing stated in the payments section of our knowledge base. These fees become due immediately when the work is completed. Once the invoice is created it will follow our standard invoicing rules. If editing bills are not paid within a 7 day period 3001web.com reserves the right to suspend your hosting until the invoice has been settled in full. We recommend if you have temporary financial difficulties you contact us before your next hosting payment is due. Without exception, ALL web design work will require full payment our total quote before work begins. Quotes for web design will be detailed and list the EXACT work that will be completed for the agreed price. Should a client ask for something not included in the original quote these tasks will be classed as extra work and will be added to the final payment. We will quote you on each extra task before adding them to the invoice. All payments will be in UK Pounds Sterling. Fail to pay any sums due to us as they fall due. Are a company and you go into liquidation or suffer the appointment of an administrator or administrative receiver or enter into a voluntary arrangement with your creditors. We reserve the right to suspend the Services and/or terminate this Agreement at any time, this, however, will never be done without notice. Customers may cancel their account at any time. Hosting fees are charged on a prepaid basis. Refunds will only be offered to clients who pay yearly for hosting or have a credit balance with us at the time of the hosting being cancelled. Refunds will only be given for remaining full months minus any gateway processing fees and a £10 administration fee. Domain name registration fees, charges for additional data transfer and charges for optional extras added to your account are not refundable under any circumstances. On termination of this Agreement or suspension of the services, we shall be entitled immediately to stop access to your Web Site and to remove all related data located on our Servers. In the event a client company ceases to trade all future hosting invoices will be cancelled without penalty, however outstanding invoices for work will still be due and the clients' account will not be fully closed until all outstanding invoices are paid in full. In the event that such invoices not be paid, they will be passed to a debt collection agency local to the clients' registered address. Providing of agreed web space and bandwidth. Any repair or hardware replacement at the server level. Security hardening and monitoring of the servers. Assistance with providing your clients with GDPR data requests where you are having difficulty. 24/7 monitoring of your site for connectivity. All sites hosted by 3001 Web are continuously monitored by various outside services. If downtime occurs we will be informed and work to correct any issues. Updates of WordPress core, plugins and theme updates for those on our managed hosting packages only. Note that major theme updates where changes will require significant editing time may still be charged. This only applies to updates not installations of new plugins or plugins that need replacing due to lack of development from their creators. Monthly backup of your website for disaster recovery purposes. Repairs to any HTML page, PHP script, CGI script, asp script caused by incorrect editing or modification by the client, the clients' employees or any outside service employed by the client. Upgrades or replacements of ANY script/program/plugin that are forced due to changes or security enhancements in server languages including PHP, ASP and more. The only exception to this is clients' who pay for our managed WordPress hosting accounts in which case all updates to WordPress core, plugins and simple theme updates are included. Major theme or core updates may carry additional fees. Editing of any HTML page, graphic, flash graphic, or source code requested by the client. Installation of any program or script automated or otherwise. Custom programming or modification to any script by our programmers. Any edits to Cpanel options the client could have performed themselves including adding of email addresses or password changes. Any task that could have been performed by the client themselves. Please note we do not offer support for any scripts or programs purchased from or written by third parties. However, you may contact us to see if we can complete any repair, modification or augmentation of the scripts you use. We will quote you on this kind of work depending on the time involved. Please note that the fees you will pay for installation or modification are labour fees. If modifications or installations need to be redone again for any reason you will be billed again. These billing terms of service are subject to change at any time by 3001 Web. You will be notified by email of any changes.